Healthy Mouth, Healthy Life! : Doesn't Everyone Eventually Loose Their Teeth? Doesn't Everyone Eventually Loose Their Teeth? 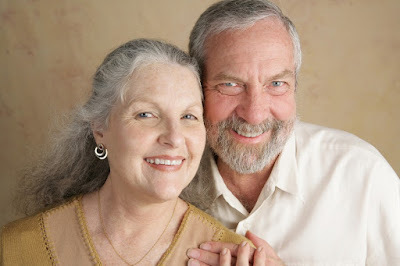 What are the best ways to avoid tooth loss as we age? Tooth loss doesn't have to be a part of aging. Periodontal Disease: Without a doubt, gum disease is the number one destroyer of smiles. When thinking of dental problems, most people think of cavities, but tooth loss is more often related to periodontal (gum and bone) issues. Gum disease starts with gingivitis, which is the inflammation of soft tissue that makes you gums red and swollen. If this goes unchecked you will progress into periodontal disease, which involves the loss of attachment of the teeth to the surrounding gums and bone. In advanced stages teeth loosen and may be lost. There is no cure for this leading cause of adult tooth loss in North America, and once it begins, it can only be proactively and professionally managed. When caught early, periodontal disease may not become a problem, but that means you must maintain your regular visits, and you may be placed on a periodic maintenance routine where you visit your dentist more than twice a year. Be sure to keep those appointments - they will help you keep your teeth. Systemic Disease: There are a host of diseases that can adversely affect oral health. For decades diabetes & heart disease have been studied, and even recently the link between these diseases and periodontal disease has been found to be stronger than ever before. It is important to be mindful of this connection, and maintaining an open door of communication with your doctor and dentist while undergoing treatment may help you minimize the effects these diseases can have on your teeth. Poor Habits: We all know a diet high in sugar, starch and acid will harm your surface enamel and lessens a tooth's ability to protect itself from decay. You may not know, however, that smoking and excessive alcohol consumption can also do significant harm. For example, both cigarette smoke and alcohol rob gum tissue of the moisture needed to keep it healthy, leaving it acidic and prone to decay, and smoking can interrupt the mouth's natural healing mechanisms. More benign habits can also damage teeth. For instance, consistently gnawing on objects not designed to be in the mouth all day, like pencils, pipes, paper clips and ice cubes, are not good habits to pursue. Additionally, using your teeth as a vice to open bottles and rip apart bags is best left to those among us committed to losing teeth, not keeping them. Prescription Medication: Lastly, certain medications can dry out the mouth in ways similar to smoking and alcohol. Many of our patients are regularly taking prescription drugs. A growing number of people, especially the older population, are prescribed two or more drugs for various ailments. This can often cause a compounding effect, causing a greater feeling of dryness. This is where communication with your physician is key. Let your dentist know what you are taking so that we can set up a game plan that may involve medications that are still beneficial without the drying effect. Also, be sure to keep your hydration in check as per your doctor’s recommendations, or use chewing gum or lozenges with Xylitol to help maintain saliva production throughout the day. Other products and techniques are also available, so if you feel like your mouth is dry lets us know! So, as you can see, allowing your “permanent” teeth to live up to their name really isn't that difficult. The old TV image of every grandpa throughout the land dropping his teeth into a bedside jar at the close of the day is far from a reality for the majority of today's seniors, and it doesn't have to be for you either. Maintain a solid oral care routine, and ask your care providers about keeping a healthy mouth throughout your years, and you'll be well on your way to ensuring your teeth stay just where you want them to be – in your mouth. My family Dentist based in Bethesda told me the health of this area of ​​the face reflects the condition of your body in general. For example, when your mouth is healthy, the same goes for your body. On the other hand, if you have poor oral health, you may have other ailments, "said dentist Edgar Hinostroza, Dental Prosthetics Academic Coordinator of the Carrión Institute. 1.- Visiting the dentist regularly will help maintain a healthy mouth, in addition to allowing the dentist to observe problems that may be the sign of other diseases. 2.- Brush your teeth after each meal. 3.- Always use dental floss and mouth rinses to protect your gums. 4.- Do not forget to renew your brushes every three times. Great blog post you have shared with us. I have bookmarked this for further information. If there is anyone who is looking for a periodontist in Cooper City are encouraged to call the office of Dr. Richard Salzmann. Your article is very informative. I agree with you there are many dangerous diseases that damage the tooth and cause of tooth loss. It's important to know that periodontal disease also known as gum disease. Anybody can be a victim of this disease. But if you are caring for your oral health on a regular basis then you can far away the mouth from these types of diseases. Here are some important and useful techniques which preserve your teeth and mouth from dangerous diseases. First of all, you should brush your teeth on a regular basis. It's an essential habit. Use only fluoride toothpaste. Dental flossing is also an important habit. You should floss your teeth once in a day. Avoid acidic foods. If you want the procedure of dental restoration then Planmeca PlanMill 40 S is good for you. It's a dental restoration mill. Your article is much interesting, thanks for sharing.